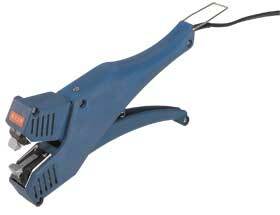 Safer than using staples, the EX-15 plastic sealing machine is a heating type point sealer that seals pouches. 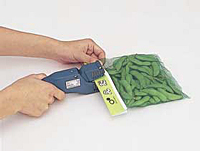 This point sealer is designed for polyethylene and laminated film pouch sealing. This sealer features an easy-to-grip shape which reduces user fatigue for the duration of the pouch sealing operation. These clamshell sealers are ideal for packaging plastic extruded netting for fresh fruits and vegetables, and for header label bags as well. The working heating temperature is 130°C (266°F). Because of their small size, clamshell sealers take up little to no space at all in the work area.